Chris Oddo has been writing professionally since 2007. He is a sports and fitness writer and blogger whose work has been published in "Tennis View Magazine," "Racquet Sports Industry Magazine" and "San Francisco Northside," among others. He graduated from the U.S. Naval Academy with a Bachelor of Science in economics. Jasmine brown rice is variety of long grain rice that is native to Thailand, but due to recent revelations about the nutritional value of brown rice, it is growing in popularity all over the world. It has a subtle nutty flavor and a floral aroma, is a great complement to vegetable or meat stir-frys, and can be enjoyed as an energy-boosting side dish in almost any meal, or even by itself. Because it is a brown rice, Jasmine Brown rice does not go through the milling process like its white counterpart. Milling removes the husk from the grain and turns the brown rice into white. But according to Dr. Michael Lam, a specialist in nutritional and anti-aging medicine, milling alters the nutritional value of the rice significantly. By stripping the hull off the rice, valuable fibers and essential oils are lost. One cup of Jasmine Brown rice contains more fiber, minerals, and essential oils than the white rice. According to Dr. Lam, brown rice contains 3.5 times more dietary fibers than white rice. This is significant because fiber is filling, and helps those who wish to eat less feel satiated sooner. High levels of essential oils in the rice also help reduce the risk of gastrointestinal and heart diseases, by aiding in the reduction of high-lipid cholesterol in our bodies. Jasmine brown rice is a significant source of manganese. Just one cup will provide you with 88 percent of the recommended daily value of manganese, and this trace mineral helps produce energy from protein and carbohydrates. Manganese also aids in the body's synthesis of fatty acids, which promotes central nervous system health and aids in the production of good cholesterol. The American Journal of Clinical Nutrition recently published a study that stated that whole grain intake was inversely correlated to weight loss, and that three servings a day of whole grain foods actually helps to decrease belly fat. The selenium content in jasmine brown rice is a key repellent of colon cancer. In providing 27.3 percent of the daily recommended value of selenium, brown rice provides a source of a difficult-to-find mineral that is also an antioxidant that helps boost the bodies immune system. Selenium also plays a key role in thyroid hormone metabolism. 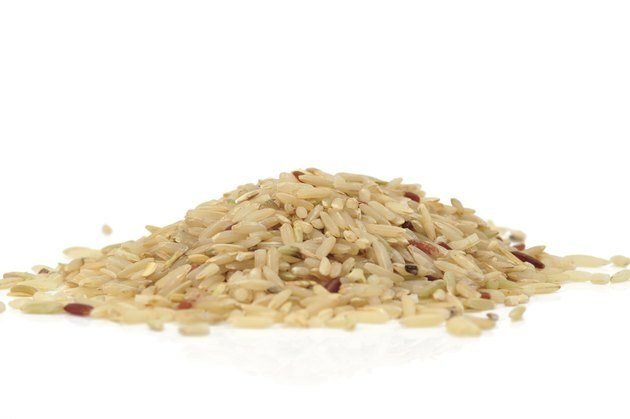 A one quarter cup serving on jasmine brown rice contains 170 calories and 35 grams of total carbohydrates.